Wow, love this tune! Skanking beats and mega trumpets, what more do you need. 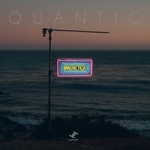 Magnetica is the first studio album from Quantic under his main solo moniker since An Announcement To Answer in 2006 He has, of course, been far from quiet in that time, with releases from many significant side-projects including The Quantic Soul Orchestra, Quantic and his Combo Bárbaro, Flowering Inferno, Quantic & Alice Russell, and Ondatrópica, and a host of thrilling live bands to match. The Magnetica album i a truly exciting listen, taking in all the influences that trailblazing troubadour Will Holland has soaked up from his travels - including the last seven years spent living in Colombia - and collaborations with musicians from Latin America, Africa, the Caribbean and beyond; blended with the innate talent for trend-setting electronic club music that has always made him one to watch. The eclectic array of guests to appear on the Magnetica album also includes Alice Russell, Shinehead, Nidia Góngora, Dereb The Ambassador, Thalma De Freitas and Anibal Velásquez.